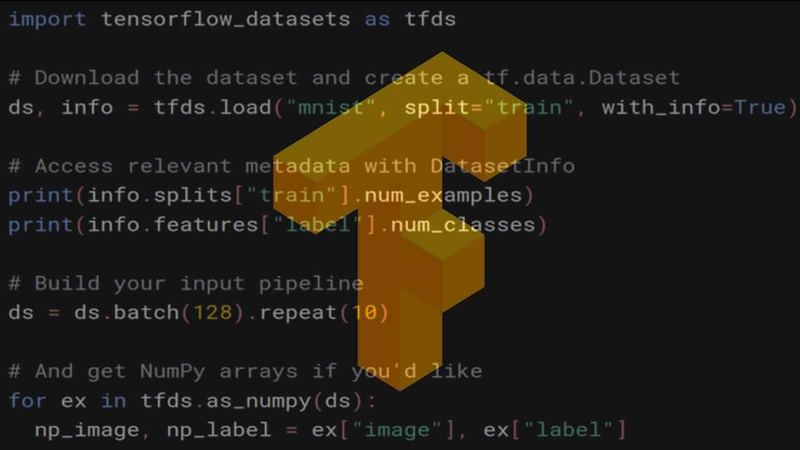 Today, we’re pleased to introduce TensorFlow Datasets (GitHub) which exposes public research datasets as [tf.data.Datasets](https://www.tensorflow.org/api_docs/python/tf/data/Dataset) and as NumPy arrays. It does all the grungy work of fetching the source data and preparing it into a common format on disk, and it uses the [tf.data API](https://www.tensorflow.org/guide/datasets) to build high-performance input pipelines, which are TensorFlow 2.0-ready and can be used with tf.keras models. We’re launching with 29 popular research datasets such as MNIST, Street View House Numbers, the 1 Billion Word Language Model Benchmark, and the Large Movie Reviews Dataset, and will add more in the months to come; we hope that you join in and add a dataset yourself. Where to download the data from and how to extract it and write it to a standard format ([DatasetBuilder.download_and_prepare](https://www.tensorflow.org/datasets/api_docs/python/tfds/core/DatasetBuilder#download_and_prepare)). How to load it from disk ([DatasetBuilder.as_dataset](https://www.tensorflow.org/datasets/api_docs/python/tfds/core/DatasetBuilder#as_dataset)). And all the information about the dataset, like the names, types, and shapes of all the features, the number of records in each split, the source URLs, citation for the dataset or associated paper, etc. ([DatasetBuilder.info](https://www.tensorflow.org/datasets/api_docs/python/tfds/core/DatasetBuilder#info)). as_dataset() accepts a batch_size argument which will give you batches of examples instead of one example at a time. For small datasets that fit in memory, you can pass batch_size=-1 to get the entire dataset at once as a tf.Tensor. All tf.data.Datasets can easily be converted to iterables of NumPy arrays using [tfds.as_numpy()](https://www.tensorflow.org/datasets/api_docs/python/tfds/as_numpy). As a convenience, you can do all the above with [tfds.load](https://www.tensorflow.org/datasets/api_docs/python/tfds/load), which fetches the DatasetBuilder by name, calls download_and_prepare(), and calls as_dataset(). You can also easily get the [DatasetInfo](https://www.tensorflow.org/datasets/api_docs/python/tfds/core/DatasetInfo) object from tfds.load by passing with_info=True. See the API documentation for all the options. Datasets with different variants are configured with named BuilderConfigs. For example, the Large Movie Review Dataset ([tfds.text.IMDBReviews](https://www.tensorflow.org/datasets/datasets#imdb_reviews)) could have different encodings for the input text (for example, plain text, or a character encoding, or a subword encoding). The built-in configurations are listed with the dataset documentation and can be addressed by string, or you can pass in your own configuration. [SubwordTextEncoder](https://www.tensorflow.org/datasets/api_docs/python/tfds/features/text/SubwordTextEncoder) for subword-level encodings (and the ability to construct the subword vocabulary tuned to a particular text corpus) with a byte-level fallback so that it’s fully invertible. For example, “hello world” could get split into [“he”, “llo”, “ “, “wor”, “ld”] and then integer-encoded. Subwords are a happy medium between word-level and byte-level encodings and are popular in some natural language research projects. assert encoder.decode(ids) == "Hello world"